The Electricity Regulation Act 1999, as amended, makes it mandatory for a Registered Electrical Contractor (REC) to issue a Completion Certificate for all electrical works (excluding minor works). 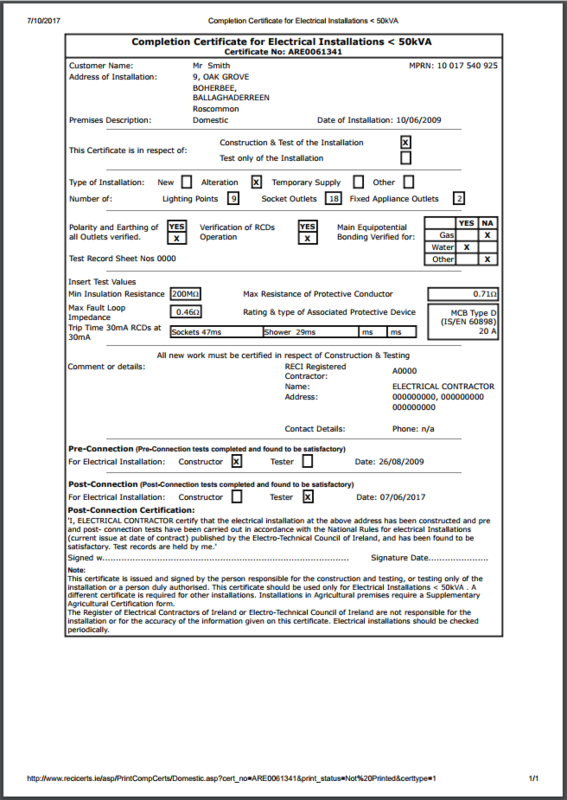 If a REC carries out minor electrical works they must be certified if requested by the customer. It is through this certification system that Safe Electric, can monitor and validate that the electrical works completed meet the required safety standards (National Rules for Electrical Installations). Certificate No. 3: Covers alterations (including additions and extensions) to existing installations. Certificate No. 3 cannot be used to obtain a connection or a re-connection of the electrical supply from the DSO. Agricultural Certificate: All electrical works in agricultural locations must comply with the National Rules for Electrical Installations. A copy of the Agricultural Completion Certificate may be required by the Department of Agriculture for agricultural buildings grant-aid. Interim electrical installations (≥50kVA): Interim Certificates are validated by Safe Electric to enable the main distribution board in an industrial or commercial installation to be energised so that a completed subsystem e.g. a lift system, or a standalone module, can be tested or commissioned. Note: Customers should always ask for a completion certificate for all electrical works completed in their home immediately after completion. 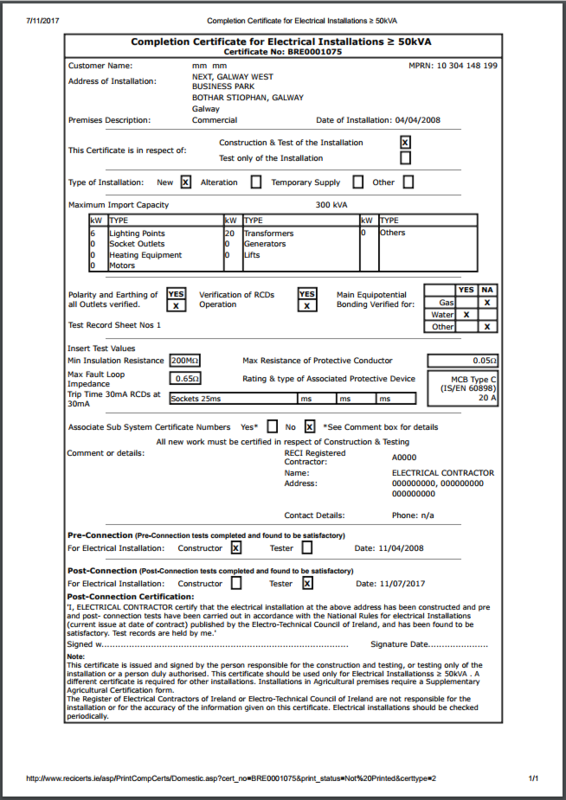 On the completion certificate, the completion of the post-connection tests should be also confirmed by the REC, otherwise the certificate is not complete. The REC will issue the original white copy of the completion certificate to the customer. A copy of the certificate will also be issued to Safe Electric. Only the REC’s named Qualified Certifier (QC) can certify electrical works on behalf of the REC. If you have not been issued a Completion Certificate and the REC is refusing to do so, please submit your complaint by completing the complaint form. The REC has a duty of care to inform the customer of any immediate or potential hazard in the electrical installation. The potential hazard may not be associated with the REC’s contract of works. If a potential hazard has been observed and the customer or REC is not in a position to rectify the hazard the REC issues a Notice of Potential Hazard (NoHz) together with the Completion Certificate.